Layla H. Zon joined the District Attorney’s office in July, 2000 and began prosecuting cases assigned to the courtroom in which she was assigned in Newton County. 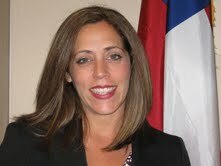 In 2003, Layla was promoted to Chief Assistant District Attorney for the Alcovy Judicial Circuit. Layla continued to prosecute all misdemeanor and felony offenses that were assigned to her before becoming the Major Felony Prosecutor responsible for prosecuting major cases included Homicides, Armed Robberies, White Collar Crime, and Special Prosecutions. In August 2010, Layla was appointed by Governor Sonny Perdue to succeed William Kendall Wynne, Jr., the former District Attorney, when he was appointed the newest Superior Court Judge of the Circuit. Layla received a B.S. in Government from Liberty University in Lynchburg, Virginia in 1996 and received her law degree from Georgia State University in Atlanta, Georgia in 2000.